Red Velvet (Hangul: 레드벨벳) is a South Korean girl group formed by S.M. Entertainment. 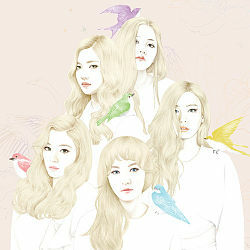 The group debuted on August 1, 2014, with their digital single "Happiness" and with four members: Irene, Seulgi, Wendy and Joy. In March 2015, fifth member Yeri was added to the group. Since their debut, Red Velvet has experienced notable success and recognition. Their first EP, Ice Cream Cake which was released in March 2015, topped the Gaon Album Chart on the 12th week of 2015 and in September 2015, the group's first full-length album, The Red, also topped the Gaon Album Chart and the Billboard World Albums Chart. Red Velvet has received a total of thirteen music awards, including two awards for choreography; Best Dance – Female and Best Dance Performance – Female Group, as well as three new artist awards. Red Velvet members have also made television appearances; Irene as a host of Music Bank, Yeri as a host of Show! Music Core, and Joy on the fourth season of variety show We Got Married.